Kev has always been a fan of U.S. consoles, so who better to send out with newcomer Wellcraft’s most popular model? 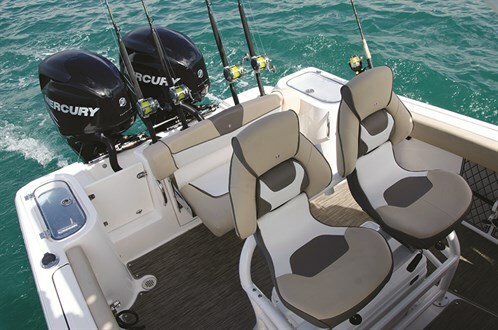 A couple of issues back we tested HiOctane Marine’s latest Wellcraft 302 Fisherman with twin Mercury Verado 400Rs. Well, loaded with every last bell, whistle, bling and tasteful Scarab styling, it was quite the show-stopper and is no doubt one of the sexiest centre consoles on the market. Unfortunately, like all the top-end centre consoles, these big guns suit those with big-gun bank accounts. 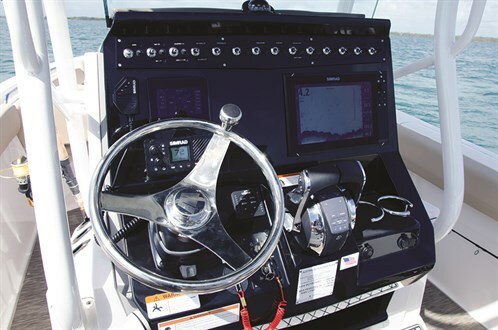 Fortunately, like most top American brands, Wellcraft has an extensive range to choose from and when you drop down to the standard sized centre consoles and bay boats, so does the price accordingly and they become quite affordable. 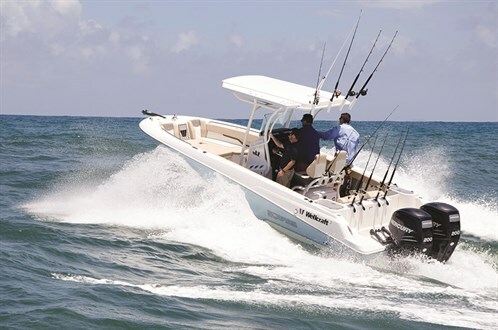 Downsizing in the range, the next Wellcraft up for test through High Octane Marine was the 242 Fisherman, which in my opinion fits in perfectly as the average trailerable and mid-range sized centre console suited to offshore and multipurpose use. Tricked up with all the bling and swanking the new twin 200hp Mercury L4 Verados, the 242 Fisherman sports a decent offshore game fishing layout combined with enough creature comforts to suit the family and entertaining, and of course the typical Wellcraft/Scarab aesthetics most certainly takes this 242 to the next level – for a centre console these boats are as stylish as they come. More for less seems to be the norm with the Wellcrafts across the range, and within the 242’s layout there’s numerous standard inclusions and optional features packed into the hull, without being overpowering or over the top and encroaching on valuable fishing real estate. For instance, the stern/console sides are primarily dedicated to a spread of game rods on the troll, a live baiting session for big kings, or even jigging and bait fishing. Personally, I like the way they have it set-up with a port and starboard live-well to separate baits, as well as having a transom door and compact rear bench incorporated – rather than everything packed into one full-length false transom. Not having a pronounced sheer line to the transom also maintains a higher than average freeboard to the stern, and this is another positive, especially when fishing in the rough and when the kids are onboard. To enhance the drive experience and further comforts onboard the console is oversized, but far from obtrusive thanks to the 2.54m beam. 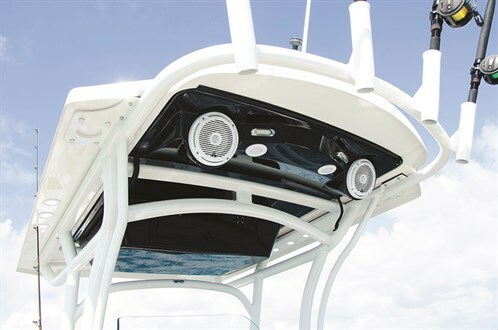 The twin sports seats allow for comfortable driving while seated or standing at the helm, along with the powder-coated framing with extra rodholders and removable esky below adding to storage. The ergonomic helm, with ample space for electronics, clear screen and upgraded hardtop/T-top, again enhance the drive experience and protection from the elements. 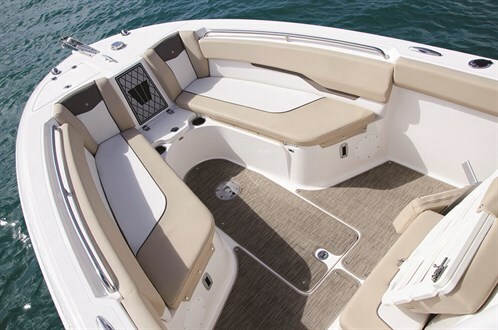 Adding to the dayboat-styled features the 242’s console has electric head built-in, and the bowrider-style lounge layout is a definite win for family day boaters. As tested, this one was loaded with numerous options like: removable seagrass mats, bow infill cushion, bow table, forward-facing backrests, SeaDek matting package, windlass anchor, Simrad NSS12 evo 3 sounder- GPS combo, and Simrad SonicHub sound system just to mention a few items – the list is endless. 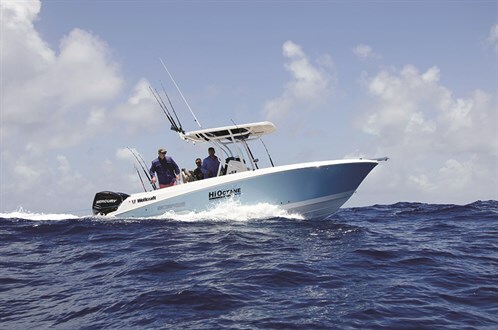 On the water, a full test day chasing game fish offshore most certainly provides enough time to get your head around the 242’s performance and handling –and that’s exactly what we did. Conditions were pretty average with the leftover slop from a previous day’s 20-knot northerly blow, creating less than ideal offshore fishing conditions. To start, a solid run up to the Pin from Runaway Bay provided good flat-water test conditions for the twin Mercury Verado 200s. The new L4s are not shy when it comes to punching the 242 up to speed (for details, see full power and performance figures in the following article). Heading offshore through the Pin the 242’s power, big flared bow and nimble ride are a good characteristics to have in tight bar crossings. In the lumpy conditions head-on, the 242 sat comfortably at an average and economical speed of 20kts. The hull’s 20-degree deadrise, flared bow and big shoulders maintain good stability and a dry ride underway, considering the conditions. Higher average speeds can be achieved offshore, however, the twin 200 Verados’ responsive acceleration need a bit of extra tab to keep the bow down. Running into quartering and following seas the hull tracks well, and again 20kts being the ideal sit-back-and-relax speed to cruise at in the choppy conditions. On flatter days, you should be able to comfortably crank the average speed up to 30kts. Off the gas the 242’s stability at troll speeds and at rest is impressive. There’s no need for fine-tuned sea legs or John Travolta moves on this boat. As mentioned previously, the decent gunwale height is maintained through to the stern and this makes them far more usable and comfortable to lean into when fishing – particularly good for jigging, bait fishing and fighting big game fish up against. As per usual when the cameras are out, the fish go into hibernation. Regardless, a full day out on the Wellcraft 242 Fisherman sure beats any day back on the office. I also had the luxury of spending another full day with the family onboard the 242 cruising the Broadwater, fishing for flatties and kicking back on the beach at the Pin. Families verdict, "When are we getting one?" And that says it all. Overall the Wellcraft 242 Fisherman has good balance between being a dedicated fishing centre console to charge out to the reefs with, as well as being just as good to head out with the family for a day on the Broadwater or out to the islands. As a wet deck with non-skid finishes it’s an easy boat to keep clean and maintain, and weighing in at well under 3 tonnes fully loaded the 242 is far from a monster to manage when towing and at the ramp. A big bonus with the Wellcrafts is they are also available in single or dual installations and can be pre-rigged in other motor brands. Like all boats, the more trinkets, bells and whistles you add, the more price tag will be affected. the numerous big-ticket options included, is not bad at all. Drop down to a single 250hp Verado without the extra bells and whistles you can get into one at around $128,900 with trailer – again, not bad value for money considering the size and the standard inclusions.